In response to my recent post A Proposed Weak Link: Neglect of Design Process: Part One, which prompted a delightful assortment of comments (thanks all! ), Dave Jacke made a comment that about a day after reading sparked something in me and suggested an improvement to the pyramid I unveiled there. Here it is with the addition of what I am realising is something that is there, and that is all important, whether we like it or not and whether we’re conscious of it or not – an underlying worldview. I want to think (and feel) about this more (is only about an hour old as an idea), but one thing I would love to hear from you at this stage – and from all of you – whatever the nature of your relation to permaculture, and the time you’ve been part of it, is what the holistic worldview underpinning the rest of permaculture actually is, in essence (what can you manage in two or three sentences, for example – I think the shorter the better at this stage for the ease of comparison, but of course take all the space you think you need). David Holmgren uses the phrase systems thinking in a similar way (Indeed his best-known definition of permaculture starts “I see permaculture as the use of systems thinking…“), but I’m feeling that holistic worldview is the better phrasing here (which I’m sure he uses too – any volunteers up for scanning his book to find out? And what about Mollison? Etc. ), something I’d also appreciate your views on. Indeed, stepping back a little, I’d also appreciate your reaction to the idea of adding this layer to the framework. 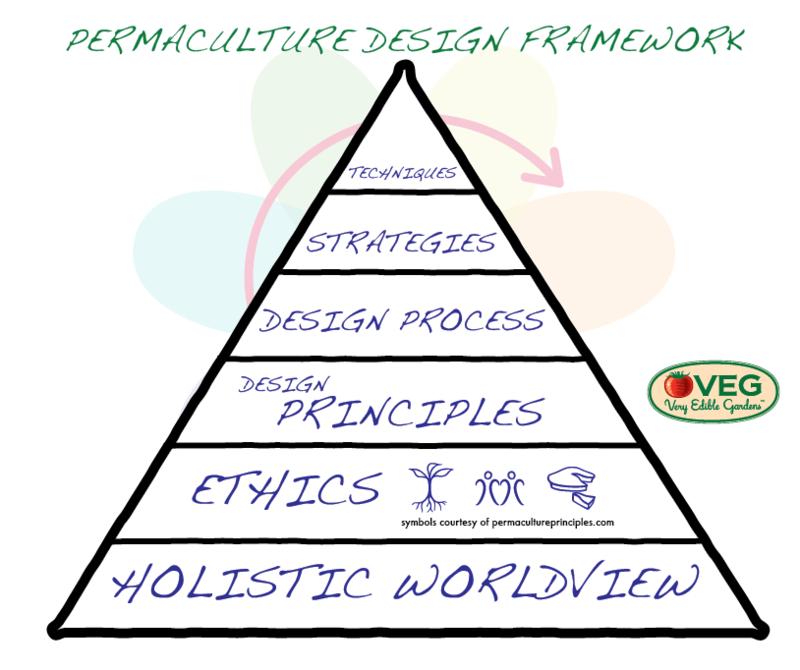 Your succinct understanding of what the holistic worldview underlying permaculture, and without which permaculture don’t make no sense, actually is, in essence. What are the core points of difference with the conventional worldview underlying modern culture? Thank you so much! I’m excited to find out where this conversation will lead us. The thing about typical systems thinking, (ie thinking in terms of elements interacting within a space that acts as a kind of container) is that to me it suggests a world view whose fundamental and real characteristics are ones of individual objects, of separation and of boundaries. I don’t know that this is fundamental to systems thinking but it seems to me that it is characteristic of how people generally view the world and so it makes sense that outside of any sort of reflection or critical thinking we would just naturally impose upon systems this outlook. What is interesting (and I find inspiring) about a wholistic permaculture worldview is that it implies a world view where the whole is fundamental and where elements and behaviors between elements are expressions of that whole (in the sense that ocean waves are expressions of water and has the character of being both water and waves). They can be seen then as the visible aspects of the whole. The whole communicating with itself or to rework what someone has already commented upon the whole dancing with itself. Permaculture is a way of engaging with the whole. Of communicating with the whole. Permaculture is an exploration. A reinvention. An engagement. A means of communication. A means of expressing the whole. A means of continuously re-imagining the whole. Okay that’s enough. Thank you for allowing the space to dwell on these matters. Thanks for your beautiful comment Jeffrey – I love the way you think/write about this stuff! The holistic worldview definitely comes after the ethics. It’s the big picture version of observation, to know the as much of the context as possible. So, I guess it’s part of the principles. What about social maturity? You have to mature enough to realize that it’s not about you, only humans, or even this planet. We’re not special and we’re not going to get any special treatment other than that we generate ourselves. Hence the ethics. Hey Milton. I look forward to exploring these questions more in due course. But I don’t think it is clear whether it even makes sense to say one comes before or after the other. For instance depending on your world view you can interpret the ethics in very different ways. Perhaps in some sense they are so inseparable that they sit at the same level? If being “indigenous” means to be “of a place”, then permaculture is a system to help people orient and become “of a place”. Hi Adam, I like that as a definition, and I like those sorts of definitions in general as they stay more in the realm of “what” we are trying to accomplish and leave the “how” for a separate conversation. One I have heard recently which I like was from Ethan Hughes and goes something like “Permaculture is simply living within the divine laws – the laws of nature”. It has a similar feel about it to the one you shared above. I think “system thinking” and “holistic worlds view” are different things although they aid each other. How? Curious to know how you describe their difference. I like that Deb – worldfeeling! These are good questions Dan. Without having “holistic worldview” defined I find it difficult comment (although I understand you invited definitions). I don’t think many within permaculture would argue against a “holistic worldview”, in the same way few would argue against a word like “considered”. Un-holistic or ill-considered approaches are plainly bad. And in that sense I wonder if saying it brings much to the table. (“Holistic” is a pretty abused term, and so brings a bit of cringe factor too.) But that said, I feel the need for… something. In the past I’ve mentioned that I think “ecological literacy” was missing from this framework, if not somewhere in the framework hierarchy, then sitting somewhere in the background. That’s a phrase I can relate to! It’s a thing I believe I’ve acquired some of, through learning, and it’s tangible enough I can aspire further towards it. Incidentally, in Permaculture Principles & Pathways, Holmgren also uses the phrases “wholistic thinking” (spelt with a “w”), and phrase “ecological perspective” to describe permaculture thinking in contrast to “reductionist perspective[s]”. But “holistic worldview”, “systems thinking”, “wholistic thinking” and “ecological perspective” all suggest habits of thinking, rather than understandings based on knowledge. I like “ecological literacy”, because it suggests both knowledge, understanding and perspective. But it *is* more limited in scope, as it doesn’t really cover the realm of human nature, whereas “holistic” covers everything and anything. Maybe “holistic thinking and ecological literacy” is closer to covering what’s missing? * Taking time to observe a situation until the context is understood from multiple angles, while studiously avoiding making judgements or leaping to solutions too soon. * Energetic literacy applied to ecological and human systems. Incidentally, the first point about taking time before jumping to solutions has been really reinforced for me through reading self-identifying rationalist (reductionist even!) literature: (http://lesswrong.com/lw/ka/hold_off_on_proposing_solutions/). The second point is informed by the laws of thermodynamics.